Whale Watching Seward AK. Cruise Passenger Pickup and Transportation Available. There are three prominent species of whales that are seen in the waters off Seward every summer. Each summer, thousands of cruise passengers sailing to or from Seward opt to take the Kenai Fjords day cruises with the hopes to see whales while taking in the scenery of the park itself. In Seward the tour boats often spot humpback whales, killer whales, gray whales, minke whales, and fin whales in the rich waters of both Resurrection Bay and Kenai Fjords National Park and Preserve. Gray whales begin arriving in March during their northern migration to their summer feeding grounds in the Bering Sea. Some of the most popular tours in Seward are in the small group Alaska whale watching trips that combine glacier viewing, wildlife and the magnificient Kenai Fjords photography tours sailing daily from the small boat harbor in Seward AK. Call 1-907-224-5271 for dates and availability. From mid June on it's a good bet to see the Humpback whales that frequent the waters around Seward Alaska each summer. Resident Orcas (Killer Whales) are seen all through the year. 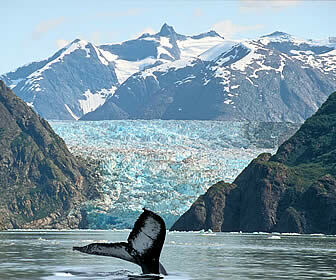 Top Rated Whale Watching Tours in Seward Alaska attract visitors to the scenic Kenai Fjords National Park every year.